Description There's only you and a night sky full of stars. Turn your imagination on and find out what pictures are hidden between the stars! Starlight 2 is here, with almost twice more levels that in original game. You've asked for challenge? Two new gameplay modes are there to satisfy those who aren't looking for easy ways. 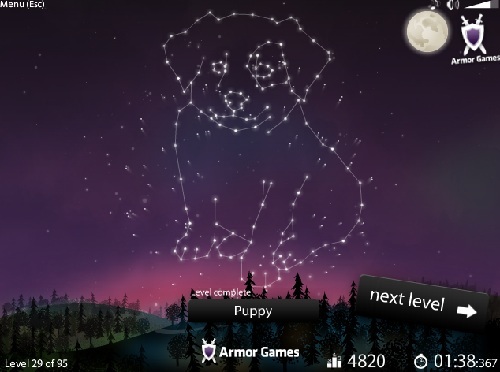 And now you can create your own constellations too! Check out built-in levels editor (with video tutorial). And don't forget to share your creation with others! Controls Use your mouse to rotate the stars. Nice relaxing game and music.